Grind Trak is a portable diagnostic tool for in-process monitoring of the grinding process. It enables the capture of various signals (currently, power and displacement) which serve as a signature of the grinding process. These signals give an insight into the fundamental microscopic interactions during the manufacturing processes, which in turn help to establish the cause and effect relationship between the input, process and the outputs of the manufacturing process viewed as a system. Frequently the signals and their observed variations by themselves are adequate to identify opportunities for solving the process problems such as size holding, burn, chatter, etc. in the case of grinding processes. In addition to such signature analysis – called “Feature Recognition” – the signals can be used for process improvement, process auditing, etc. Such intimate knowledge of the manufacturing processes are also the seeds for predictive or deterministic innovation of novel manufacturing processes. The work reported here was carried out to demonstrate these wide variety of possibilities in one specific manufacturing process – the abrasive grinding processes. 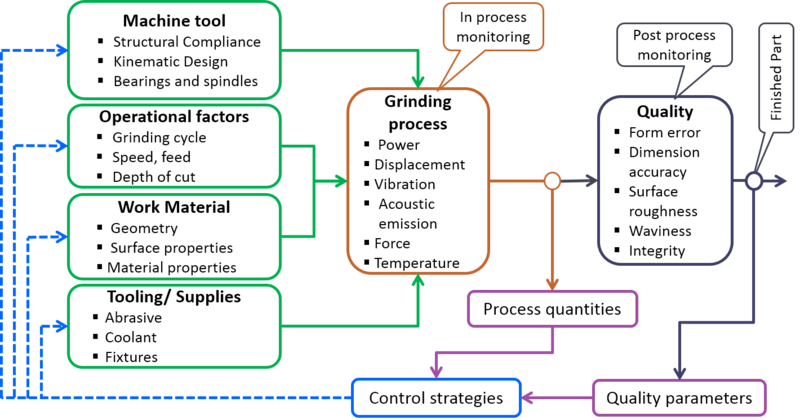 The work reported here is preliminary and lays the foundation for long-term and sustainable developments in grinding process innovation and their industrial realization. Grinding process signals have been measured and, analyzed for decades. Few attempts exist across the globe for a portable device. Development of such a tool in a university setting, and extending its use for practically relevant industrial applications has been one of the key features of this work. Audit the system, compare with a benchmark. The mobile nature of this diagnostic tool and its use enables any of the production operations where it is used, to be treated under controlled conditions. Otherwise such scientific treatment is possible only in a few laboratory equipment available in a few universities or in the R&D centers of large companies. When solving process related issues, the major benefit of such an approach is the scientific basis as to what the root cause is, for a given issue with the grinding process enabling us to find global, long-lasting solutions to the problems rather than a local or transient solution. Furthermore, it enables digital storage of the current status of a grinding system – similar to an ECG signature for humans. The use of such digital data of in-process signals from real life manufacturing processes and their coupling to big data analysis is envisioned as a wide open field for innovation in the manufacturing sector. As a part of a project at IIT Madras – on development of a high precision grinding machine tool, a project being led by Prof Ramesh Babu, an understanding was required of the grinding process and how the grinding machine tool impacts the grinding process and hence the performance of grinding operation. To know more about the grinding process and the impact of various input parameters (machine tool, abrasives, coolant, work material, process parameters, and other tooling) on the grinding process and hence the outputs (quality, cost, and cycle time), we needed a way to monitor and record the grinding process in machine tools used under industrial production operations using digital diagnostic tools. I worked on the development of such a tool, the guidance for which was given by – by Dr K (Subbu) Subramanian of the STIMS Institute. Under the guidance of Dr Subbu, we learnt about the grinding system – how to view it as an Input Transformation Output (ITO) system. We also learnt about the six fundamental microscopic interactions in the grinding process, how each of the input parameters affect the process and what the outputs are. We also learnt that by studying certain in-process signals as a signature of the process, we can determine certain critical features taking place in the process therefore helping us to get one more data point of the grinding process, in addition to the result on the work-piece. Portable – the unit must be light weight, rugged and easy to carry. Short deployment time – the unit must be capable of being installed on any machine in less than 30 minutes. Modular – since more sensors will be added in the future, the kit should provide a provision for that. High sampling rate – to enable real-time signature of the grinding signal to capture the grinding process phenomenon with very short transient time of the order of milli-seconds and smaller. Replicate the industrial grinding process conditions (equivalent diameter, specific material removal rate, chip thickness, etc.) in a laboratory setting. Be able to extract relevant features of the process that help evaluate the machine tool performance such as dynamic stiffness, maximum possible material removal rate, etc. A report of the same can be downloaded here [glyphicon type=”download”] . Two modules of the Grind Trak has been developed The tool is being actively used to get the process signature in a wide variety of precision grinding process applications. As a part of this process, there was also a requirement to development of additional toolkits to augment the scientific approach to grinding. These toolkits help to make important calculations of the process parameters quickly of a wide range of cases. 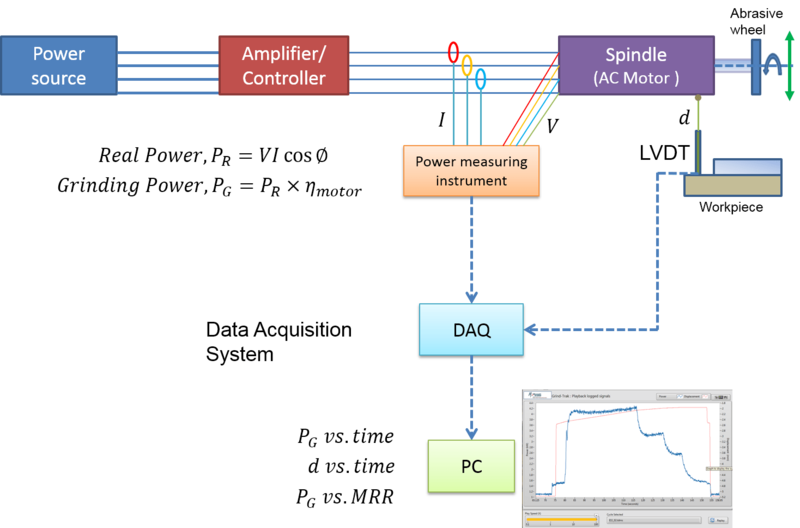 Evaluate various options available for sensors – power, displacement. Evaluate sensors available from across the globe – UK, USA, Japan, etc. Asses the characteristics of various sensors and make a choice of cost vs performance. Assembled all the tools involved in the form of a portable kit which can be easy relocated to any machine and deployed within a span of 30 minutes. Handbook of machining with grinding wheels, Marinescu et. al. Developed a process documentation sheet, which acts as a checklist to capture most of the important aspects of a grinding system to enable efficient first-time capturing of the most important grinding system information. Developed a Knowledge Integration Document that captures and represents the system information, the process signals, analysis and the technical and the system outputs for a grinding process under study. Based on Dr Subbu’s course and subsequent guidance. How these features represent the microscopic interactions taking place and hence the quality on the component? Most of the interactions with Dr Subbu were online –through such online interactions and personal discussions was a good distance learning exercise. Apart from this, the other sources of information in each of the cases above were the internet and my past experience of working on various projects at the Centre for Innovation (CFI) at IIT Madras. The unit was beta tested in 2-3 industrial settings. Based on the feedback, improvements were made and then extensive testing was conducted in an industrial setting at Micromatic Grinding Technologies Limited (MGTL), having been used successfully in more than 40 cases. Learnt about the System Approach and applied this knowledge to solve process related issues like burn, poor surface roughness, chatter, etc. thereby validating the use of Grind Trak as a process solving tool. Used this tool for process optimization – primarily reduction of cycle time and increase of dressing skip. Used this tool as a benchmarking tool – for comparing performance of different wheels, identifying the difference in the process behaviour on two machines grinding the same component. Established a protocol whereby, the baseline process signal of each machine is captured for every machine. Provided training at both plant locations to the application engineers on the grinding system, and the use of Grind Trak and analysis of process data and its documentation. Also used this as a lab exercise and teaching tool for Dr Subbu’s Grinding Technology Workshops. Selection of sensors based on cost and objective requirements from suppliers selected across the globe. Development of user-friendly Graphical User Interface (GUI). Working knowledge about the grinding process. Analysis of signals – feature and pattern recognition. Working with cross functional teams with a common purpose of learning about the grinding system and its implementation. Ability to work across many worldwide suppliers – securing information from a wide variety of sources. Distance learning skills – learning about the grinding process through distance courses conducted over Skype by Dr. Subbu. The grind-trak development and implementation was carried out from the idea stage to a widely accepted commercially viable unit in less than 18 months! This required substantial perseverance and navigation through an industry sector (manufacturing) that is deeply rooted in traditional ways and not eager to make major changes in short time duration. The risk involved in changes in the manufacturing operations is high, unless the solution has high record of success with clearly identifiable benefits. Followed the model of prototyping and learning in each step and building up on it. At each stage, the Grind Trak was unit tested, each of its parts (hardware and software) individually tested with real world examples to ensure their effectiveness before being integrated and deployed. Use as a deployment in grinding machine tools to provide real-time process data to the operator to enable better control of the process and the machine tool. 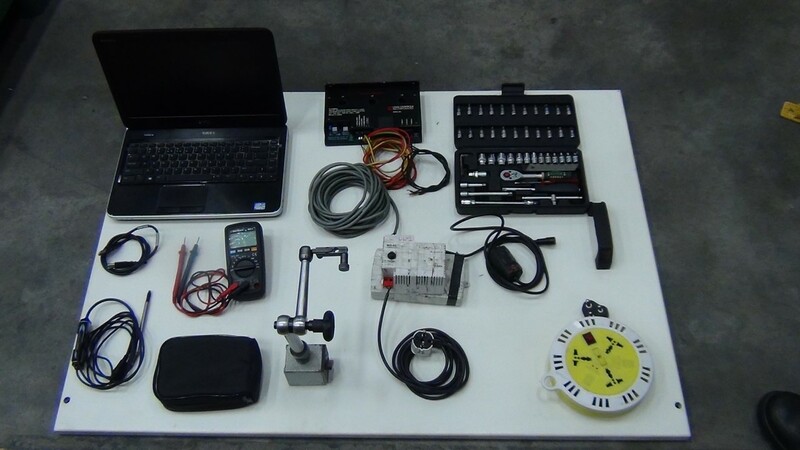 One of the basic diagnostic tools used in the process diagnostics for Grinding Process Solutions (GPS) – a new business initiative of MGTL and the STIMS Institute, dedicated to grinding system optimization, process problem solving and auditing. Addition of more sensors such as vibration and acoustic emission to get additional unique information about the grinding process are being explored. Development of an application knowledge base which can be used for design and analysis of grinding cycles. Development of an intelligent system which predicts the health of a grinding system and predicts the correct process parameters to be used for any given application. As a control system which can take corrective action based on system drifts and brings the system to its most optimal state. 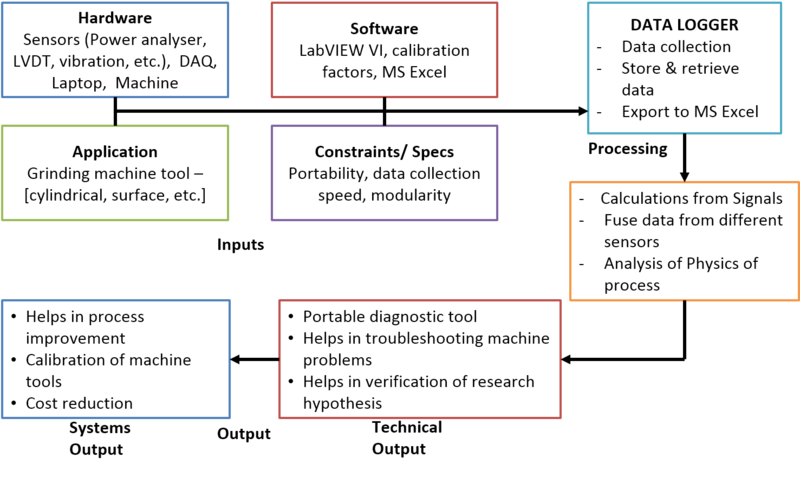 Big data analytics to gain insights into the operating conditions, correlations between the inputs – process – outputs of a grinding system, usage, load and performance aspects of a machine tool.